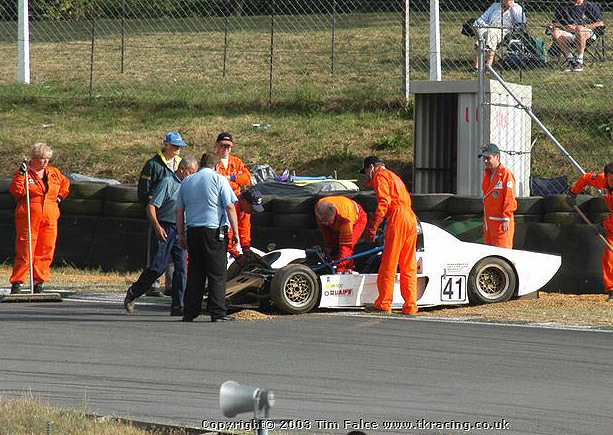 Marshalling is all about having fun, but at the same time doing a worthwhile job in helping to make Motorsport a safer place in which to participate. Marshals are all volunteers and officiate at all UK race meetings regardless of size or importance. The guys you see dressed in orange are the backbone of all Motorsport and without their support, motor racing simply wouldn't happen. There are many types of jobs that need doing at every race meeting from track marshalling to helping in Race Control, Pit lane, Start Line and Assembly. Each job is an important role in making a race meeting run not only safely, but also smoothly. Making sure the correct cars are on the grid for the right race and at the right time. Getting involved as a volunteer marshal really couldn't be simpler. You decide which meeting you wish to volunteer for and contact the organising club to let them know you would like to help out. Naturally there is a grading scheme in place and all marshals are recognised and licensed by the Motor Sports Association, the governing body for UK Motorsport. If you would like further information on what marshalling is about, or to see how the grading and training scheme works, visit www.marshals.co.uk where you should find the answers to all your questions. If you would like to come along to a race meeting and try marshalling out for a day to see if 'it's for you' then contact Stephen Green, National PRO for the British Motorsport Marshals Club (contact details on the web site) and he will arrange for you to visit the circuit of your choice and be placed with an experienced team of marshals to make your day more enjoyable. Many thanks to Stephen Green of the BMMC for contributing to this page.